June is a very good month for fans of the Burlington Northern. AZL has released BN tri-level autoracks. Two runner packs and two singles have been released. The first set is item 91004-1. The road numbers are: 802154, 802719, 802768, 802937. The second set is item 91004-2. The road numbers are: 801805, 905296, 908088, 908249. The MSRP is $131.00. The first single car is item 91954-1. The road number is 810053. The second single is item 91954-2. The road number is 802232. The MSRP is $38.00. The next BN release are 60’ beer cars. A runner pack and a single have been released. The runner pack is item 90262-1. The road numbers are: 782418, 782403, 782421, 782473. The MSRP is $120.00. The single car is item 91262-1. The road number is 734168. The MSRP is $34.00. Canadian Pacific 53’ well cars have been released. A runner pack and a single car are available. The runner pack is item #90602-4. It comes with six 40’ containers. 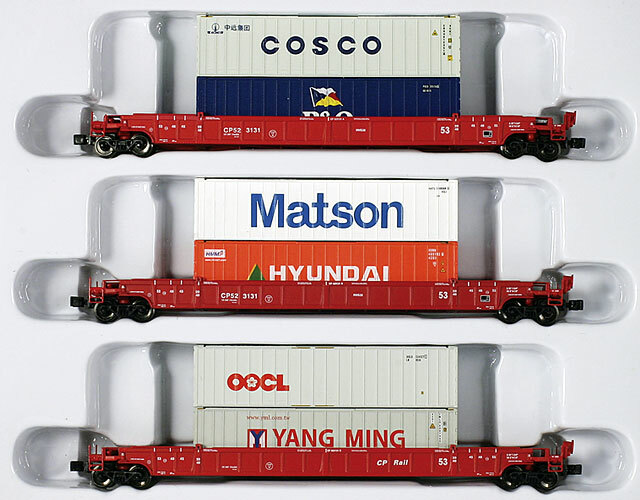 The containers are lettered for Cosco, P&O, Matson. Hyundai, OOCL and Yang Ming. The road numbers on the cars are: 523131A-523131B-523131C. The MSRP is: $133.00. The single car is item 91602-2. It comes with a Canadian Tire 53’ container and a CP Railway 48’ container. The road number on the car is 527726. The MSRP is $46.00. SCL waffle side gondolas have been released. A runner pack and a single were issued. The runner pack is item 90249-1. The road numbers are: 746809, 746813, 746820, 746828. The MSRP is $117.00. The single car is item 91249-1. The road number is 746829. The MSRP is $32.00. Finally, AZL has re-released Chessie System bay window cabooses. Two road numbers have been released. Item 92006-1 is road number 901. Item 92006-2 is road number 902.